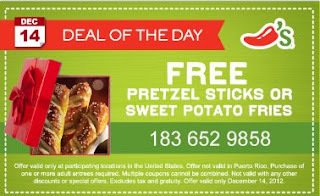 I have not tried the Pretzel Sticks or Sweet Potato fries at Chili's yet so I am excited about this one. I usually get soup and an entree for lunch. The other day I had the Chicken Enchilada Soup and the Southwestern Mac and Cheese. It was so good. My Hub had the Southwestern Chicken and Sausage Soup & Grilled Chicken Quesadilla. Needless to say we switched soups because mine was on the thicker side like a stew, which he loves. His soup was more broth like with more liquid which I love. We both were very happy once we switch. The joys of sharing! I can't wait to try the Pretzels and the Sweet Potato Fries though.